And still I run: I run and run, without rest, as if even now there is time and purpose and I will gain, at last — before my spool of silence unwinds — what I’ve yet to know. In 1928, Aganetha was at the top of her game, a gold medalist in the 800 meter race at the Amsterdam Olympics. Her extraordinary running ability took her far away from her family’s farm in rural Canada, where she had already suffered more grief and loss than many people experience in a lifetime. From the time she was a small child, Aggie was a runner — fast and indefatigable. She was the one the family sent running for the doctor when there was an emergency on the farm. Because she was a distance runner and not a successful sprinter, Aggie never competed again in the Olympics. Life brought her disappointment and betrayal — but through it all she kept running. Eventually, she became a newspaper obituary writer, after being demoted from the crime beat when the male veterans of World War II return home. Aggie’s imagined obituaries of her family members are interspersed throughout the novel, poignantly emphasizing that their ordinary lives will soon be forgotten. Snyder builds suspense by shifting gracefully between the present, as Aggie returns to her family farm with two mysterious young people who claim they are documentary filmmakers, and the past. As Aggie’s mind wanders from the surprising events unfolding around her to memories of the past, it gradually becomes clear that Aggie’s long, complicated life holds heartbreaking secrets. 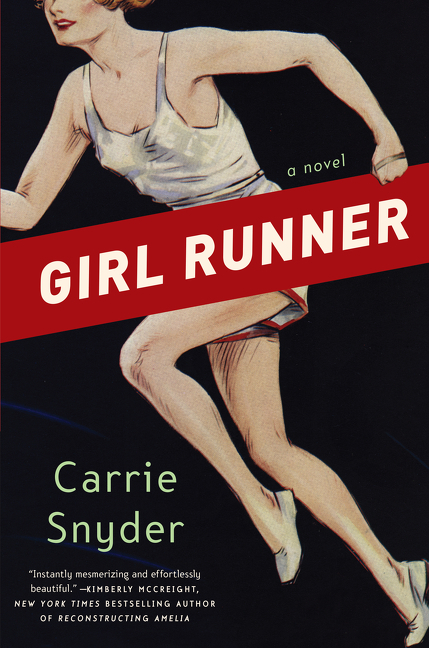 Girl Runner is a lyrical and achingly sad novel. An independent woman ahead of her time, Aganetha Smart is a fully realized, sympathetic character who will spur readers to think about aging, regret, and the difficult choices life often sends our way. I’ll tell only what I’ve spent my life promising: that I regret nothing. And it will be a lie, of a kind. But it is also the truth. It’s my favorite kind of book — well-written literary fiction that enlightens me about something I knew nothing about (in this case, the history of women’s participation Olympic track and field). I am SO not a runner and yet the subject fascinates me. My daughter is a sprinter for track and field but she ought to be a long distance runner. That’s her natural ability, long distance but there seems to be no glory in long distance so she forces herself to sprint. It’s a totally different training plan. I could see myself picking this book up and I never would have given it a second glance before your review. I am not a runner AT ALL and I loved this book! Sounds wonderful. Thanks for the in-depth review. I’ve also really been enjoying Carrie Snyder’s blog — so glad I discovered her. Aggie sounds like one of those characters readers will keep in their hearts for a very long time. I really wish I liked running — but I just don’t . . . I prefer almost any other kind of exercise.